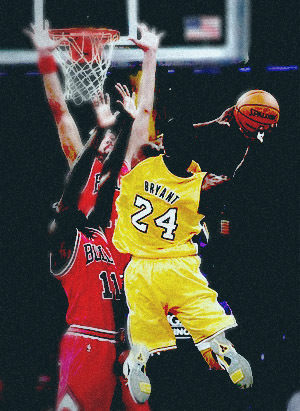 Kobe Bryant goes up for shot against Bulls. Shannon Brown says he always wants to play well against the city he grew up in, Chicago. On Tuesday night, he did just that, scoring 21 points off the bench, leading the Lakers to a tough 98-91 win over the Chicago Bulls at Staples Center. In a game that was close throughout, Brown provided the spark off the bench, scoring 15 of his team-high 21 points in the second quarter, leaving the Lakers clinging to a 51-49 lead at the break. Lamar Odom had a strong game, scoring 21 points and grabbing eight rebounds, and Kobe Bryant added 20 and a team-high five assists as the Lakers won their fifth straight. Pau Gasol had a tough time, but did have a double-double with 12 points, 11 rebounds, and five blocked shots. The Bulls were led by All-Star guard Derrick Rose, who tormented Laker guards all night, getting to the rim seemingly at well en route to a game-high 30 points, to go along with eight assists, and five rebounds. Joakim Noah made life difficult under the rim for Pau Gasol all game long, scoring 19 points and grabbing 16 rebounds. Former USC star Taj Gibson added 16 points and 12 rebounds. With the Lakers falling behind 75-74 early in the fourth quarter, it was the bench that took over the game, not the starters. Shannon Brown, Matt Barnes, and Steve Blake all hit three pointers (Blake hit two) during a stretch where the Lakers turned a one-point deficit into a 12-point lead at 95-83. The Bulls got as close as six with two minutes left, but Pau Gasol’s tip-in off a Bryant miss with a little over a minute to go sealed the game for the Lakers, and pushed their record to 13-2. For the game, the Lakers’ bench outscored the Bulls’ bench 39-10, highlighted by Brown’s 21 points. Matt Barnes added 10 points, five rebounds, three assists, and a blocked shot. The Lakers’ defense continues to get back to form, holding the Bulls to 39.5% from the field and 4-20 (20%) from the 3-point line. The Lakers have held their last four opponents under 100 points, and have been dominate on the defensive end since the second half of the game in Milwaukee last Tuesday. It was also only the second time in 15 games they did not score 100 points. The Lakers’ next game is Friday night in Utah, as they face the new-look Jazz for the first time this season. The Jazz recently came off a very impressive road trip that included several huge come-from-behind wins, highlighted by back-to-back victories in Miami and Orlando.